Beethoven's string quartets have been perennially popular from his time to our own. They anchor the entire string quartet repertory and represent one of the pinnacles of all chamber music of the time. With respect to their place in Beethoven's life, they span the whole of the composer's working period but pop up at irregular intervals, causing us to wonder whether Beethoven had to be in a particular frame of mind, or perhaps to have a new idea about how to go about their composition, or a compelling commission before digging in. Like the rest of Beethoven's oeuvre, the string quartets fall into three main groups, each of which has its own personality. The early quartets (Op. 18) give distinct evidence of the composer's promise and originality. The "Razumovsky" quartets Op. 59 come from one of Beethoven's most fertile and productive periods. Each is a classic in its own right. Collectively they show enormous strides in Beethoven's development and imagination. Opp. 74 and 95 continue in the same direction but with significant differences of character. The remaining quartets, from Beethoven's late period, are rugged, highly individual works that inadvertently document the composer's struggle with progressive hearing loss. Over the whole of the eighteenth century the growth of participation of amateurs in music-making was a major force in the rise of classical music. Large churches and courts had their own musical establishments. The ability to make music at home was a sign of social status, but it is also clear from countless narratives that noblemen who played well derived a great deal of contentment from their achievement. This underlying groundswell played an important role in Beethoven's life, for without the driving force of amateur players in Vienna, Beethoven's chamber music would exist in much more limited quantity. The foremost quartet in Vienna was the Schuppanzigh Quartet, formed in the early 1790s. It played in the home of Count Carl Lichnowsky (1761-1814). The count, who had been a pupil and friend of Mozart, hosted the quartet every Friday morning. In addition to the count (first violinist), the quartet included Louis Sina, Franz Weiss, and Anton Kraft. Each of them in turn came from families including other musicians and had connections to other noble houses in Vienna. They attracted the interest of teachers, particularly since Ignaz Schuppanzigh (1776-1830), who was Beethoven's teacher in Vienna, trained so many other musicians of the time. He was held in highest esteem both as a violinist and as a conductor. He served as the concertmaster of Count Razumovsky. Schuppanzigh was also the dedicatee of many works by other composers, among them Franz Schubert's 'Rosamunde' Quartet. Over the course of his life, especially after 1815, Beethoven's quartets passed beyond the realm of capability of assiduous amateurs. This change too had parallels in the broader musical scene, as concert halls grew in popularity and attracted the interest of a more bourgeois audience. However, Schuppanzigh remained a faithful supporter to the end. The late quartets, which were difficult to play and equally difficult to comprehend on one hearing, are particularly indebted to this fidelity. The range of techniques used by Beethoven throughout his quartets is stunningly broad. Each work has its own intricacies. Many have intertextual relationships with other works by Beethoven and by other composers. This set of quartets offers strong evidence of Beethoven's close study of the string quartets of Haydn (1732-1809) and Mozart (1756-1791), particularly Haydn's "Russian" quartets Op. 33 (1781) and Mozart's "Haydn" quartets (K. 387, K. 421, K. 428, K. 458, K. 464, K. 465; 1782-85). The first two works of the set, which had been delivered to Prince Lobkowitz in the autumn of 1799, were revised the following year, but some of the material does not survive today. Beethoven's first published collection of string quartets (Op. 18, published in Vienna in 1801) consisted of six works he composed between 1798 and 1800. By the reckoning of some these constituted the major achievement of his early years in Vienna. He came to focus on the quartet medium only after a broader exploration of other instrumental combinations including a string trio (Op. 3, Eb Major, composed before 1794), a string quintet (Op. 4, also Eb Major, 1795), a set of three trios (Op. 9, 1797-98) and a handful of other chamber works, all composed since 1790. Opp. 3 and 4 were the earliest to be published (Vienna, 1796); the trios Op. 9 followed (1798). Many experts take Op. 18 as a lexicon of procedures devoted to the classical touchstone of motivic unity. The melodies are incisive but elastic. Elasticity facilitated extension, transformation, and other techniques essential to the Beethoven canon. The third movement of the quartet Op. 18, No. 5 offers a prime example of the diversity of stylistic approaches and careful balance between them that Beethoven seemed so easily able to achieve. 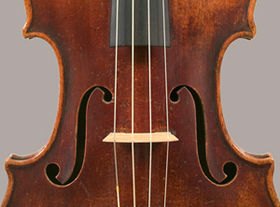 It is a theme with variations, each of which is different in its melodic permutations, textural fabric, dynamics, playing techniques, and method of passing the focus from instrument to instrument. In the audio example we hear the St. Lawrence String Quartet. Lacking the timbral resources of a full orchestra, the quartet had to sustain attention through easily recognized thematic material, but in the most engaging instances thematic material would tease the ear through subtle means of variation. Of course it was common at the time to intersperse the components of recognizable musical form with virtuosic passages that helped to articulate musical form. Beethoven was highly skilled in building momentum throughout a movement, and as one approached a final cadence the players needed still to be in control of all their skill and energy. A significant portion of the moral support that allowed Beethoven to focus on this cogent, wide-ranging collection of quartets was provided by a nobleman of Beethoven's generation--the Bohemian prince Franz Joseph Maximilian von Lobkowitz (1772-1816). The prince spent most of the year in a new, magnificent palace in Vienna; important components of the family legacy (including music manuscripts and family portraits) are preserved near Prague. Although he was a general in the imperial army, the prince had a highly cultivated love of music and played several instruments. Without his indulgence, we would lack seven of Beethoven's string quartets, three symphonies (the third, the fifth, and the sixth), and the triple concerto. Lobkowitz was an ardent fan of the music of his time. He was particularly fond of the music of Handel and Haydn. He studied the violin and cello. He was a member of Vienna's Gesellschaft der Musikfreunde. He met Beethoven in 1795 and two years later, upon turning 25, he established a Kapelle of five musicians in the family's Viennese palace. Its concerts between 1798 and 1806 featured string and piano quartets, arias from recent operas, and other chamber works. In 1807 Lobkowitz assumed the direction of productions at the Hoftheater (the court theater). Johann Friedrich Reichhart wrote of the count in 1808/09 that "he lived for music day and night." Under his direction the number of musicians rose steadily. At one point he had in his employ 43 instrumentalists and 36 singers. The payroll became unmanageable. To underwrite his costs Lobkowitz recruited a number of noblemen to the cause of his musical enterprises. Among them were Count Kinsky and Archduke Rudolf, the emperor's son. By 1814, however, Lobkowitz himself was almost bankrupt. He fled the city. The Kapelle was dissolved in 1814, but the Lobkowitz Palace was remembered as the home of an "Academy of Music." The count died in 1816. Recordings courtesy of the Saint Lawrence String Quartet. Used by permission. Portrait of Beethoven made by Christoph Willibrord Mähler in 1815 (WikiCommons). Andrey Kirillowitz Razumovsky (1752-1836), the quartets' patron, was born in St. Petersburg. His diplomatic career began at the age of 24. When he arrived in Vienna as Russian ambassador (1792-99; 1801-06) he had already served posts in Italy, Denmark, and Sweden. Like Count Lobkowitz he had a solid musical education and played the violin well. The sister of Razumovsky's wife Elisabeth was married to Count Lichnowsky, another of the great lovers of chamber music in Vienna. Razumovsky's relationship with Beethoven and the quartets Op. 59 began in 1804. The works themselves were published in 1808, the year in which Razumovsky asked Schuppanzigh to establish "the best quartet in Europe" in his palace. Performances there appear to have been entirely private. Beethoven paid homage to the Razumovky by including "Russian themes" in the first second quartets. In Op. 59, No. 1 the "Thème Russe" forms the basis of the final movement, which cascades out of the final cadence of the preceding movement. We hear that movement in the recordings listed below provided by the St. Lawrence String Quartet. The two themes were widely quoted in later works that alluded to Russian subjects. As Beethoven's style developed, his arsenal of techniques for both clarifying and obscuring form took on many guises. Among them were metrical dissonance, in which dynamics were used differently across parts so that accentuation in one part contradicted that in another. In Op. 59 and many of his other works of the same period Beethoven employed extremes of register as a magnet to lure the listener's attention towards significant melodic content. Only five of Beethoven's string quartets were in a minor key. Op. 59, No. 2, in E Minor, was the second of them. Somewhat in contrast to his treatment in Op. 18, No. 4, Beethoven plays tricks with key here by offering long forays into E Major and thus avoiding the pessimistic mood of some of his later minor-key quartets. The expressive use of pizzicato in the slow movements of Nos. 1 and 3 illustrates still another device that Beethoven used to good advantage. In 1814 Razumovsky (retired as ambassador but now serving as special Russian representative) undertook an unprecedented reconstruction of his palace in order to accommodate up to 700 guests for the Congress of Vienna (1814-15) and the arrival of Czar Alexander I. A fire in the expanded palace on the last day of 1814 soured Razumovsky on Vienna. The quartet was dismissed. Razumovsky returned to Russia, where he became an ardent promoter of Beethoven's music. Schuppanzigh followed. 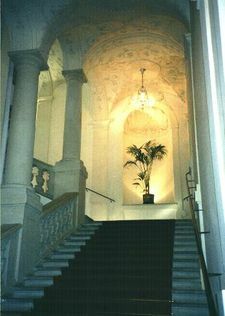 Staircase to the music room of the Lobkowitz Palace, Vienna. (WikiCommons) Many works by Beethoven had their premieres here. Beethoven's "Harp" quartet, composed in 1809 and published a year later in Leipzig and London, was dedicated to Count Lobkowitz. The nickname comes from passages in the first movement requiring pizzicato playing by rotating pairs of instruments. These markedly contrast with a lyrical melody. Beethoven's work on the quartet occurred shortly after he had composed most of the Fifth Symphony. 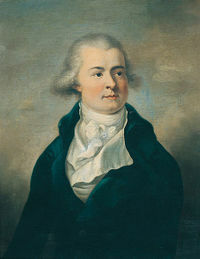 Portrait of F. J. M. von Lobkowitz by A. F. Oelenhainz. (Wiki Commons) Note that the pose is the same as in the portrait above. Only the manner of dress has changed. Lewis Lockwood calls attention to the concentration that the composer brought to bear in the year when Vienna was torn apart by strife. As Napoleon's army captured the city the royal family sought safety in Hungary. Beethoven made the best of the situation by agreeing to join Jérôme Bonaparte's service in Kassel. This tactic led to a complicated arrangement whereby the archduke (Rudolf), Count Lobkowitz, and Prince Kinksky would jointly guarantee a generous annual salary for Beethoven to remain in Vienna. It was the serenity this new financial security brought him that enabled him to work with so much focus during 1809 and for several years thereafter. The autograph survives in Krakow. Op. 74 is exceedingly rich in musical ideas, idioms, and playing techniques used to enhance the work's architecture. We find one of Beethoven's familiar harmonic tripods--formed by contrasting the governing tonality (Eb Major) with two keys related to it by relations other than the fifth--supervising the overall plan of the quartet. Although these tripods often stood on legs of equal harmonic distance, the relationships here are more complicated. The Ab of the slow movement is the subdominant (the tonality based on the fourth degree) of Eb, but it is also the submediant of C Minor, the key of the scherzo. In a sense, C Minor is a harmonic pivot, even though Eb Major is the fundamental key. Beethoven is still paying homage, though obliquely, to Haydn in some of the work's passages, but the work's nickname refers to a more improvisatory quality that Elaine Sisman likens to a fantasia. Sometimes nicknamed the "Serioso," this quartet was nominally composed late in 1810 but may not have achieved its final form until a year or two later. Schuppanzigh took part in the premiere in 1814. Publication did not occur until 1816. Seow-Chin Ong views it as a close relative of the Egmont overture, Op. 84 (also 1810), partly because the two works share the key of F Minor and project similarly funereal moods. The overture and other incidental music for Goethe's drama (1775-88) were prepared for performance at Vienna's Burgtheater. Structural details of both works also contribute to the possibility of a close relationship between the two. Beethoven's contribution was solicited in the autumn of 1809. String quartet No. 11, Op. 95, in F minor: detail of sketch in Beethoven's autograph, 1810. Pierpont Morgan Library, New York: MS Cary 48. Many fragmentary "sketches" for his works in Beethoven's hand attest to the number of times he changed his mind about the final realization of a work. This work is a notable case of wavering intentions. Some of these changes may have resulted from new thoughts provoked by a work in a different genre that otherwise dominated Beethoven's consciousness. Among the sketches for the quartet Op. 95 is a set of materials preserved at the Pierpont Morgan Library in New York. The first signs of his deafness were noticed by Beethoven before the year 1800. None of his quartets, and very few of his other works, were composed while he had the benefit of full hearing. His own accounts of the condition suggest tinnitus, but the cause was never determined. By 1824, when the Ninth Symphony has its premiere, the composer was so deaf that he had to depend on his eyes to see the audience's applause. Although Beethoven was depressed and socially withdrawn during much of his "middle" and "late" periods, numerous efforts were made to ameliorate his situation. 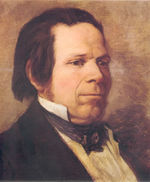 Johann Nepomuk Maelzel, the inventor of the mechanical panharmonicon (1805) and the metronome (1815), designed several ear trumpets for Beethoven (1813). They did not benefit him much, but he continued to retain the hope that "hearing machines" would come to his rescue. Several examples can be seen at the Beethovenhaus Bonn. 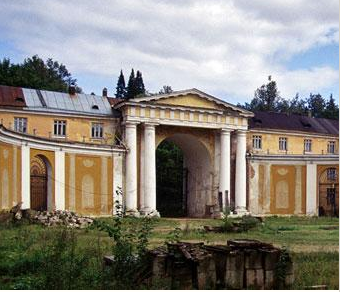 The country estate of Nicolai Golitsin, near Moscow. Golitsin sold it to another Russian count before it was completed (1810). Image from the World Monuments Fund. The commission for Opp. 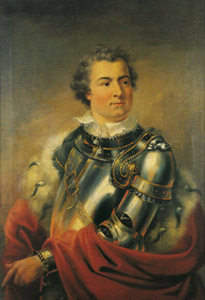 127, 132, and 130 offered by Prince Nicolai Golitsin (also Galitzin) owed to the intervention of Schuppanzigh, who had moved to St. Petersburg in 1816 but returned to Vienna (where he became leader of the court opera) in 1823. There he was given permission by Beethoven to give the premiere of the new quartet, which Beethoven completed in 1825. The Golitsin (also Golitsyn, Galitsyn) family had come to power through regimental service, particularly in the Great Northern War and, in Beethoven's time, in the Napoleonic Wars. In place of predictable harmonic schemes and the elegiac melodies that had characterized Beethoven's Middle Period, Op. 127 adopted a harmonic plan based on tonally distant (sometimes enharmonic) key relationships. Owing to the quartet's poor reception at its premiere, Beethoven reinstated the violinist Josef Boehm (who had served in Schuppanzigh's absence) as concertmaster and personally supervised rehearsals for future performances. There can be little doubt that the first audience would have found the work perplexing, for its construction was radically different from that of earlier quartets. Birgit Lodes, in tracing the contemporary contributions of German writers and thinkers to the study of mythology in ancient sources, calls particular attention to Johann Gottfried Herder's seminal publications of Indian and Brahman myths as direct influences on the first movement of the quartet Op. 127. For her the Maestoso/Allegro juxtapositions create the necessary oppositions to express temporality and timelessness. Beethoven's Tagebuch cites Herder (1744-1803) and discloses his interest in composing works that narrate Greek and Indian myths. It was Herder's writings that engaged Beethoven's interest also in Ossian. Schuppanzigh, being entirely practical in his orientation, failed to appreciate Beethoven's flights of philosophical fancy. Schuppanzigh was back in Beethoven's good graces by the time this quartet had its premiere, on November 6, 1825. Schuppanzigh was also responsible for the premieres of Opp. 130 and 135 (the latter premiered after Beethoven's death). Op. 132 consists of five nominal movements. Of these the third is a highly complex sequence of eight sections, some with German qualifiers appended to the traditional Italian tempo indications. Some examples are the "Heiliger Dankgesang eines Genesenen an die Gottheit, in der lydischen Tonart" [hymn of thanksgiving from a convalescent to the Deity, in the Lydian mode]. The concluding section of the third movement is characterized as "Molto adagio. Mit innigster Empfindung" [very slow, with most intimate feeling]. Beethoven had intended that Op. 127 should have six movements rather than four, but the plan to add movements after the first and (old) third movement never materialized. Op. 130, composed shortly after Op. 127, did alter the hallowed movement structure of the string quartet but in an entirely different way from the abandoned idea for Op. 127. After three very busy movements in a more or less conventional mold (Adagio-Allegro; Presto; Andante...poco Scherzoso) the composer introduced three more arbitrary ones—a dance "in the German style"; an aria-like cavatina; and the concluding Grosse Fuge, Op. 133. Manuscript sources demonstrate that Beethoven changed his mind several times about details of the third movement. The last five quartets are linked motivically, such that the "arch" contour (up-up-down, as in the finale of Mozart's "Jupiter" Symphony [No. 41]) is ubiquitous, although the precise relationships vary from instance to instance. Also in common with the other late quartets, Beethoven's ideas about movement structure changed continuously. This was especially the case with final movements. This last "movement" (written late in 1826), consisting of an overture and seven movements, was a work in its own right. The overture of the Grosse Fuge introduces a four-note subject that can be heard either as a contorted version of the "Jupiter" Finale subject or as a distillation of the Kyrie Eleison motive of Mozart's Requiem. In fragmented, stuttering iterations, it survives all the rhythmic and metric permutations to which it is subjected. Neither the listening public nor the publisher was easily able to conceive of Op. 133 as an integral part of of Op. 130, which, however, was incomplete without a final movement of some kind. Much commentary has been offered on the apparent dissolution of earlier conventions of movement structure in chamber works. Beethoven defies them all. 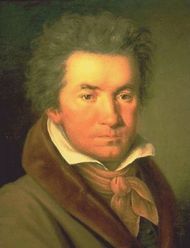 Other commentators imagine Beethoven to have been offering a summing-up of his many approaches to quartet composition, a culmination of his long struggles with the genre. The C# Minor quartet, completed in 1826, consisted of what were nominally seven movements. Of these the fourth was extremely elaborate. Dedicated to Baron Josef von Stutterheim, it is said to have been Beethoven's personal favorite. The quartet shares motivic material with Opp. 132 and 130, leading some performers to group the works as a triptych. The work shares with the other late quartets a challenging harmonic landscape. Its final cadence is to C# Major. For many listeners it seems to share an esthetic space with Beethoven's Missa Solemnis. Rainer Cadenbach notes the contemporaneity of this work with Franz Schubert's Quartet in G Major, op. 161 and, further, the fact that both works had posthumous premieres under Schuppanzigh. There were in fact other resonances between the intellectual interests of Beethoven and Schubert (1797-1828) between 1825 and 1827. These included the facts that both were in deteriorating health, were filled with a growing sense of foreboding, were preoccupied with the songs of William Shakespeare, and produced prolifically works of a generally grave character. 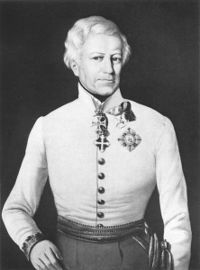 Baron von Stutterheim (1764-1831) was an Austrian field marshal who fought in various Napoleonic campaigns (in the company of other Austrian leaders such as Counts Trautenberg and Schwarzenberg) in Russia (1812) and Italy (1814). He was a friend of Count Razumovsky. The quartet consists of a long series of episodes, and episodes within episodes. The gradual dissolution of movement structure in the late quartets finds its apogee in this work. It veers, often at cautious tempos, from mood to mood in a decidedly mercurial way. Beethoven exploits a gradual thickening of textures to produce a sort of crescendo, the high register (particularly in the first violin) to mark some climaxes, and the use of pizzicato (especially in the cello) to articulate some of the work's fragmented melodies. Formally the quartet is divided into six sections. We feature quotations from the sinewy opening of the quartet, the elegiac beginning of the fourth section, and the concluding portions of the sixth, where a spirit of ambiguity still inheres in the oscillations between shouts and murmurs. The motto preceding the Finale of the Quartet Op. 135. The text says, "Must it be?" "It must be. It must be." Like the first quartet of Op. 18, the last string quartet Beethoven composed (late in 1826) was in F Major. It is less blatant in its pursuit of extremes than the other late quartets but expresses the composer's torment no less capably than the others. Its final (fourth) movement explores, with bilingual labels, a "difficult decision" (Der schwer gefaßte Entschluß) in a rhetorical (Grave-Allegro-Grave-Allegro) manner. Thematically the work refers back to passages of the quartets of Op. 18, as though it were a final effort to give a summing-up of his absorption in the quartet genre. Beethoven was a strong believer in preserving authoritative editions of his music. The original Breitkopf & Härtel edition of his works was published in 1862-65. It was one of several collected editions the firm published in that period for composers who, having died over the preceding century, still had a robust following in Germany. Since research into Beethoven's life and music continues vigorously to the present day, it is inevitable that reasons for publishing new editions accrue over time. The Beethoven-Archiv in Bonn, the city of Beethoven's birth, has been preparing a new critical edition (by G. Henle Verlag) of the composer's works to reflect and absorb all that has been learned over recent decades. It was begun in 1961. Scores are provided on an "as is" basis. They may be used for any non-profit or educational purposes. All notices and acknowledgments must be retained. Cadenbach, Rainer. "Gleichzeitigkeit als Problem: Beethovens und Schuberts Streichquartette vom Juni 1826," Beethoven II: Studien und Interpretationen (Cracow, 2003), 221-236. Caplin, William. "The Genesis of the Countersubjects for the Grosse Fuge," in The String Quartets of Beethoven, ed. William Kindermann (Urbana and Chicago: University of Illinois Press, 2006), 234-261. Chua, Daniel. The Galitzin Quartets of Beethoven: Opp. 127, 132, 130. Princeton: Princeton University Press, 1997. Churgin, Bathia, "The andante con moto in Beethoven's String Quartet Op. 130: The Final Version and the Changes on the Autograph," The Journal of Musicology 16 (1998), 227-253.
Cooper, Barry, "The Lost Slow Movement from Beethoven's Quartet Op. 18, no. 2," Eighteenth-century Music 9 (2012), 237-251. Indorf, Gerd. Beethovens Streichquartette: Kulturgeschichte Aspekte und Werkinterpretation. Freibuerg im Breisgau: Rombach Verlag, 2004. Kindermann, William (ed). The String Quartets of Beethoven, ed. William Kindermann. Urbana and Chicago: University of Illinois Press, 2006. Krebs, Harald. "Metrical Dissonance and Metrical Revision in Beethoven's String Quartets," in The String Quartets of Beethoven, ed. William Kindermann (Urbana and Chicago: University of Illinois Press, 2006), 31-59. Lockwood, Lewis. "Beethoven's 'Harp' Quartet: The Sketches in context," The String Quartets of Beethoven, ed. William Kindermann (Urbana and Chicago: University of Illinois Press, 2006), 89-108. Lodes, Birgit, "'So träumte mir, ich reiste...nach Indien': Temporality and mythology in Op. 127/I" in The String Quartets of Beethoven, ed. William Kindermann (Urbana and Chicago: University of Illinois Press, 2006), 168-213. Ong, Seow-Chin. "Aspects of the Genesis of Beethoven's String Quartet in F Minor, Op. 95," in The String Quartets of Beethoven, ed. William Kindermann (Urbana and Chicago: University of Illinois Press, 2006), 132-167. Craig Sapp's keyscape plots of harmonic structure in Beethoven's string quartets show how the composer deployed, and deviated from, the conventional structures of instrumental music of his time. The rules were few: a movement had to begin and end in the same key; a piece had to begin and end in the same key; the first, third, and fourth movements of a typical four-movement work were each associated with a specific formal plan in which harmony and thematic substance were interdependent. However, the composer was free to compose in a more exploratory and/or expressive manner in the second movement. The color codes used in Sapp's keyscapes. Note that the darker shades of each virtual key represent the minor mode; the forward colors are used for the major mode. The keyscape visualizations shown here present the overall harmonic plan of each movement of each quartet. The extent to which the composer strayed outside the main key is indicated by the height of contrasting colors. The proportion of time he strayed is indicated by the width of the contrasts. Harmonic progressions are detailed on the bottom line. Broader changes become more general as one moves towards the top of the plot. Few listeners focused on the bottom level, but recent studies in cognition show that the plane on which they listened on this pyramid (ascending from the particular to the general) varies individually. Beethoven's harmonic usage conforms to most general precepts in Op. 18. In Op. 59 we begin to see that each work has one at least one movement that strays from the norm. Through Op. 127 Beethoven stays within the conventional four-movement plan. As the number of movements increases (in all of the remaining works except Op. 135), the correlation of a harmonic plan with the ordinal position of a movement evaporates. Op. 131 is the most deviant. It is also the quartet that most defies a general notion of movement structure. The keyscapes also document the great attraction of "thirds relations" (outside the context of relative major-minor ones) to Beethoven. Formal schemas were based on the relation of keys a fifth apart (e.g., C Major/G Major, D Major/B Major). A "movement in a contrasting key" was likely to be in G Major if the main key of the work was C Major. However, Beethoven became progressively more interested in relations such as F Major/Db Major or B Major/G Major. We see an early sign of this tendency in Op. 18, No. 3 and a late example in Op. 135. This kind of harmonic relationship is inevitably tangled up with Beethoven's love of modal ambiguity (i.e., between major and minor). The short route to thirds relations went through a relative keyin its outward appearance. This edition of the Beethoven String Quartets, which is based on the Breitkopf & Härtel edition (Ludwig van Beethovens Werke: Vollständige kritisch durchgesehene überall berechtigte Ausgabe, 25 vols. [Leipzig, 1862–8/R], vi), has been prepared by Edmund Correia Jr. and Frances Bennion using notation software developed by Walter Hewlett. This wiki site has been developed by Craig Stuart Sapp and Eleanor Selfridge-Field. Valuable insights and advice have been offered by several of our colleagues at Stanford University. Audio contributions by the St. Lawrence String Quartet are warmly acknowledged. Scores published on December 21, 2012 by the Center for Computer Assisted Research in the Humanities (CCARH) at Stanford University. Parts published on May 11, 2017. CCARH is a project of the Packard Humanities Institute. This page was last modified on 12 May 2017, at 01:25. This page has been accessed 422,043 times.